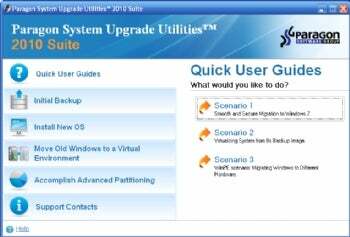 Upgrading to Windows 7 is normally a painless process, but if you want a bit more granular control over the process you might like Paragon's System Upgrade Utilities 2010 ($30, buy-only). The package leverages the company's imaging, partitioning, and boot manager software in a way that allows you to backup your old system, create a separate partition for the OS if you so desire, and run both your old OS and the new Windows 7 from the same drive. The Paragon System Upgrade Utilities home screen shows you the basic tools provided in the suite. Note: The "Download" button at the program's page downloads the manual only; to buy the program, you'll have to visit the vendor's store. Once you have the program, you need to add the free Adaptive Restore add-on for HDM 2009 to convert to .vhd.